If you want to lose 15 to 30 pounds in the first month of dieting, Mark Davis, M.D says that The Millenium Diet is the right program for you. This rapid weight loss program does not involve any gimmicks or expensive diet products and is based on simple foods that can be found in any grocery store. Davis claims that his diet is revolutionary because it has been tested in thousands of patient visits and has proven to result in successful outcomes. By observing thousands of patients, Mark Davis noted that there were dietary factors common to those that were overweight. As soon as the offending foods were eliminated, rapid weight loss occurred. The Millenium Diet eliminates most of the foods that trigger weight gain such as sugar and high GI carbohydrates, while reducing others to a minimum. The basic concept of the diet involves portion control, which naturally leads to a reduced intake of calories. Davis says that most dieters find it cumbersome to count calories and portion control is much easier to learn. Dieters are provided with lists of recommended foods and guidelines for creating meals that are appropriate for a rapid weight loss diet. This allows the dieter to customize the diet according to their lifestyles and individual food preferences. The Millenium Diet includes three meals per day and an optional evening snack. These are composed of foods that are low in fat and calories such as fruit, vegetables, whole grains, lean proteins, low-fat dairy products. Most processed foods should be avoided and alcohol is not recommended. Fruit, vegetables, whole grains cereals, whole grain pasta, legumes, skim milk, low-fat yogurt, parmesan cheese, Egg beaters, chicken, turkey, fish, lean meat, fat-free salad dressing, light mayonnaise, mustard, light popcorn, whole wheat pretzels, low-calorie jello, diet soda, Crystal Lite, tea, coffee. Mark Davis claims that aerobic exercise will produce the fastest weight loss. Brisk walking or jogging at least two miles, three days a week, is recommended. Toning exercises like weight training can increase muscle mass, which enhances calorie burning, so a combination of aerobic and strength training is ideal when your goal is to lose weight. The Millenium Diet: The Practical Guide for Rapid Weight Loss retails at $13.99. Will probably produce rapid results. Educates dieters about portion control, which is a proven successful method for weight loss. Encourages the intake of low glycemic carbohydrates. Encourages eating breakfast, which has been associated with a greater degree of weight loss success. 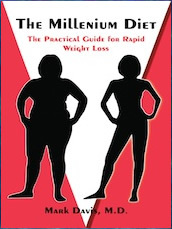 Includes information about the physiological factors involved in weight gain. Addresses the mental and emotional connection with successful weight loss. Includes information about vitamins and minerals. Meal plan is too low in calories for physically active dieters. Restrictive and requires the elimination of many healthy foods. The Millenium Diet is lacking adequate essential fats. Encourages the intake of artificial sweeteners and high-mercury fish such as tuna. Does not include recipes or an exercise plan. Does not provide maintenance guidelines. The Millenium Diet is basically a low-calorie regime that utilizes portion control to allow dieters to easily manage their caloric intake without the need to actually count calories. Like other rapid weight loss programs of this type, dieters will typically lose weight initially, but there is a high risk of rebound weight gain as normal eating is resumed.